Are you tempted by bowls of candy and trays of cookies at work? Say no to secondhand sweets, and think twice about the food you offer at meetings and around the office. Are you eating enough fruits, vegetables and whole grains? Eating small, frequent, healthy meals or snacks will keep your energy up and make you less likely to overeat at your next meal. Are you eating enough fruits, vegetables and whole grains? (for your daily food plan.) Use snacks to fill nutrition gaps. Eating small, frequent, healthy meals or snacks will keep your energy up and make you less likely to overeat at your next meal. Food safety note: Be sure to keep perishable foods, such as dips and cut-up fruits and vegetables, refrigerated. They should spend no more than two hours at room temperature. If a refrigerator is not available, bring nonperishable foods, such as dried fruits, nuts and cereal-based snacks. How do you manage special nutrition needs (allergies, diabetes) at meetings? 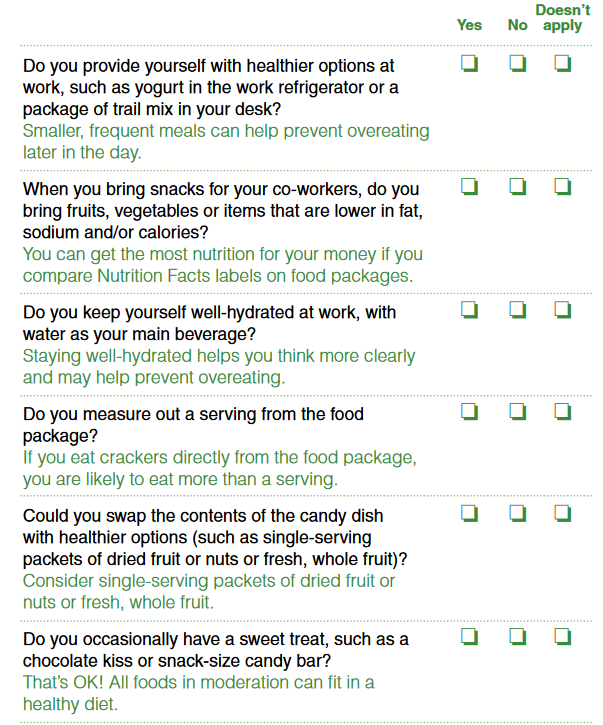 If you are ordering or bringing the snacks, be sure to find out about special nutrition concerns ahead of time. Provide a variety of healthful foods so people have options. Cut foods in snack-size portions, too. Choose wisely at the vending machine. Candy bars are tempting, but you have healthier options. Look for snacks with fewer calories, lower sodium, less fat and no trans fats. Some better choices include 100-calorie packs, baked chips, granola bars, dried fruits, crisps and pretzels. If the vending machine doesn’t offer some of these items, ask your employer to provide some healthier options. Eat Smart. Play Hard. 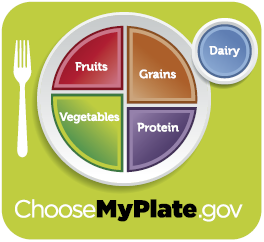 is an initiative of the Food and Nutrition Service, U.S. Department of Agriculture.